George 3rd. (he died 1820) or George 4th. 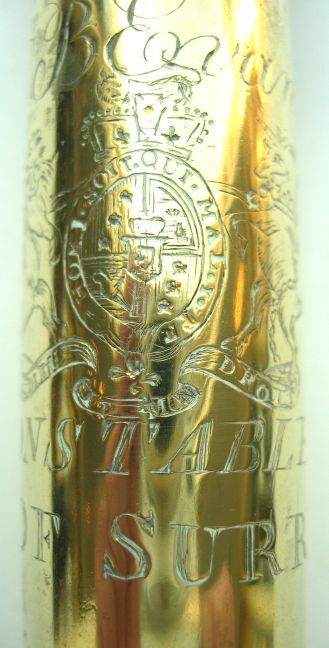 (1820-1830) all brass tipstaff. Usually they had wood as a grip or, handle - so, fairly rare. The inscription is B.EVANS CONSTABLE OF SURREY. More correctly this should read 'A Constable of Surrey' - and the spelling of Surrey as Surry is not a mistake - rather the phoenetic spelling of the time. 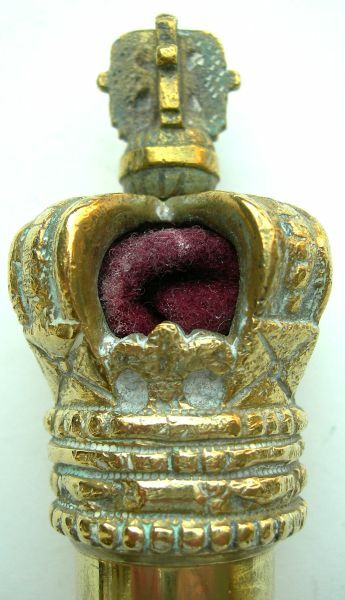 He would have been a High Constable in a biggish town, such as Guildford.The heralic Royal arms are the 1816 to 1835 pattern and show the Hanoverian Arms in the centre , with the Crown from when they became a Kingdom in 1816. This type of cross is known as a Cross Pate. Fully visible from all angles. it is often used on staves. I begin to understand your fascination! Hi Ian. Yes, I think this is a good example and unusual in this format. I particularly like the mis-spelling and the wrong designation, just so typical of the period. We have - another - public holiday tomorrow, so will try to remember to phone to say hello to you and Ann. Hugh, from when I first discovered what they were, they have held a great attraction. I think that it is more what they represented , then even their lovely shapes and workmanship. The tipstaff was essential for the official to perform his duties and therefore, represents the history of law and order in Great Britain for very many centuries. The fact that we could only find evidence of around 2000 remaining, is a tregedy - because it means so many have been lost or, destroyed. When I hold this one, for example, it is more than a highly valuable item - who was B. Evans - what did he actually do - what drastic situations did he face - who were his family, are there still descendents ? however, it is potentially worth very much more - there isn't another one. 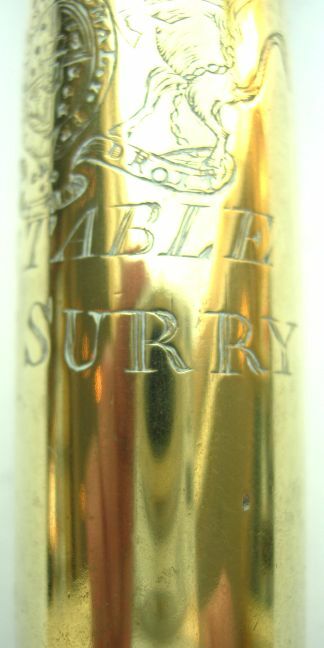 Just came across this post for the Surry tipstaff. Can I just say, I don't think it's legitimate. I think the engraving is spurious. If you evaluate the engraving of the coat of arms and on the words, you can easily see the engraving is sub-standard, child like, and not of the type of work that one finds in legitimate engravings of the period.